Solarize Anchorage is about to enter its second summer. Basically, this program facilitates a match up between a solar installer and a neighborhood to get a bunch of solar on neighborhood roofs in one season, generally with price incentives for high participation. Last year it was wildly successful in the Airport Heights neighborhood of Anchorage, this year it will be implemented in 4 Anchorage neighborhoods, including my stomping grounds of Spenard! How exciting! Here I need to make a full disclosure before I continue. I recently started working for Alaska Center for Energy and Power (ACEP), which along with the Alaska Center is shepherding the program forward. I have helped with some tech support to the neighborhoods who are currently choosing which installer to work with on the program. What follows is all from my own point of view of how I would best take advantage of this or a similar program and doesn’t reflect ACEP positions or, indeed, what might be best for you! So, first of all, as a 4-plex, the Ecoplex is officially a commercial building, code-wise, since it is not a duplex or single family home, so my installation rates will probably be a bit higher (the municipality will require an engineering stamp for code approval, for instance). The Solarize program is aimed at residential, but installers have the final say on who can participate, and I have verbal assurance that I can. Not having posted here in 2 years, my big news is that I have another possibility for a home to participate in the program: I moved in with my partner this year, a mile south of the Ecoplex. I am a bit sad to not live on site for now, but family and friends (and my fruit trees) live there so I visit nearly every day, and there is a good chance we’ll end up living back at the ‘plex someday. So, while the roofs of what I will call the Newcastle House are not as well situated and shade free (and need a good re-shingling first), there might be a second option for the program this year! But back to the known quantity of the roof of the Ecoplex – does it make economic sense to go solar this year? One push is that a 30% federal tax credit will start to phase out after 2019. For the last few years I have had to keep a somewhat large savings account since I had very high deductible marketplace health plans for my son and I, and needed that security. Now that I have a much lower deductible employer health plan, I’ve got a bit of money I could spend. I can probably handle the $10,000+ outlay for professionally installed grid-tie solar, as long as there aren’t any surprises in my life or installation costs. The other big things I would consider spending my money on this summer would be paying down my property loan or getting a high efficiency boiler to replace my 82%-ish efficient cast iron one. Maybe I’ll reproduce the math in another, nerdier post, but a quick back of the envelope gave me a barely over zero internal rate of return for the boiler replacement (given that my current boiler aint broke). The ‘plex has a sub-4% interest rate, and some of that is tax deductible as an expense on the rental property. Surprisingly, putting up solar, correctly sized and with the 30% tax credit, came out to a 6% rate of return! The best deal of those I’m considering. In my next post, I am going to talk about how I would size my own roof solar photovoltaic system, and my assumptions behind the rate of return. Many of the fruits we rely on in the temperate regions come from one family. Believe it or not apple, pear, plum, cherry, quince, and even raspberry, service berry, aronia, mountain ash and strawberry all are in the rose family. Many of our ornamental bushes are in this family as well. As a food forest gardener seeking biodiversity, I want to plant and gather from as wide an array of genetic material as possible. Plants in the same family can concentrate pests that they are vulnerable to – fireblight, canker, insect predators such as leaf rollers, even damage from mammals such as voles, rabbits, and moose (the bark and leaves of the rose family are pretty universally tasty to these browsers – I’ve even seen a young moose angrily put up with a rose’s thorns to eat the branches, stomping the plant in between mouthfuls!) To be fair, there are benefits to family relationships too – by rights my pear and sweet cherry shouldn’t bear fruit, because neither has a pollinator tree from the same species (and different but compatible cultivar), however they do bear some fruit. I’m guessing a sour or bush cherry helps with pollinating the sweet cherry and mountain ash with the pear (and maybe there is some very limited self pollination.) In any case, here are 10 fruits that I do, or possibly could grow in my zone 4 (max of about 1000 Growing Degree Days, just over 100 Frost Free Days) Alaskan food forest – some require favorable microclimates, most are worth a try, some might be a big stretch! My observations are for growing (or trying to grow, or contemplating growing) these plants in Anchorage, Alaska. 1. Rhubarb (Polygonaceae family) – here is a standard Alaskan fruit, that of course is not biologically a fruit. great! No leaf roller, easy to propagate by splitting, early availability. Jams, pies, crumble, ice cream topping, lemonade substitute, savory sour soup ingredient – What’s not to love! Green gooseberries subbing for limes in this mojito! 3. Hardy Kiwi (Actinidiaceae family) – a small non-fuzzy fruit with a soft kiwi taste when it finally ripens in the fall. Great for fresh eating, these grow well for me! 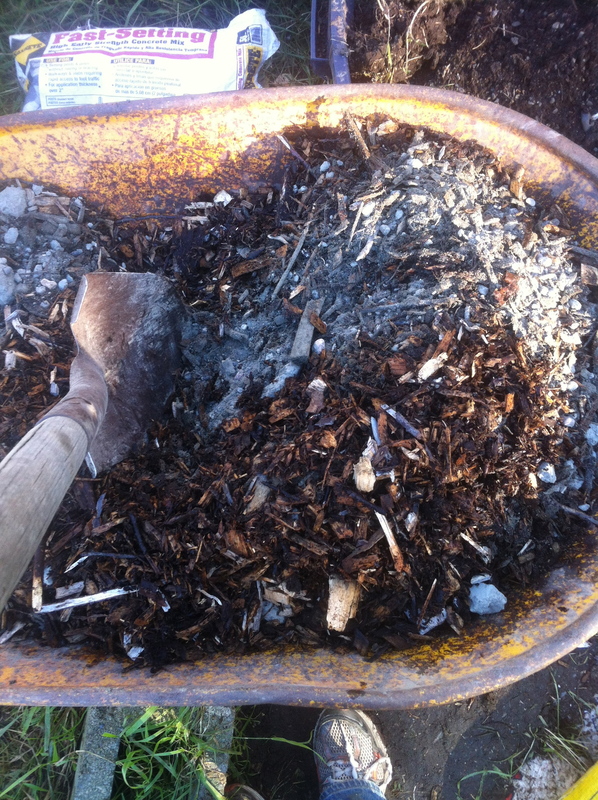 I am hoping to root some vines so I can propagate to other parts of my yard. But don’t pick too early or they are astringent and hard! 4. Highbush Cranberry (Adoxaceae family) – this native viburnum is ubiquitous in the local birch forest under story. I love the tart taste, though the big seed is best spit out and milled out of sauces. There are other viburnums such as nannyberry that might do well here too. 5. Honey Berry (or Haskap, or edible honeysuckle – Caprifoliaceae family) – A good sub for the harder to grow blueberry, well at least in color! 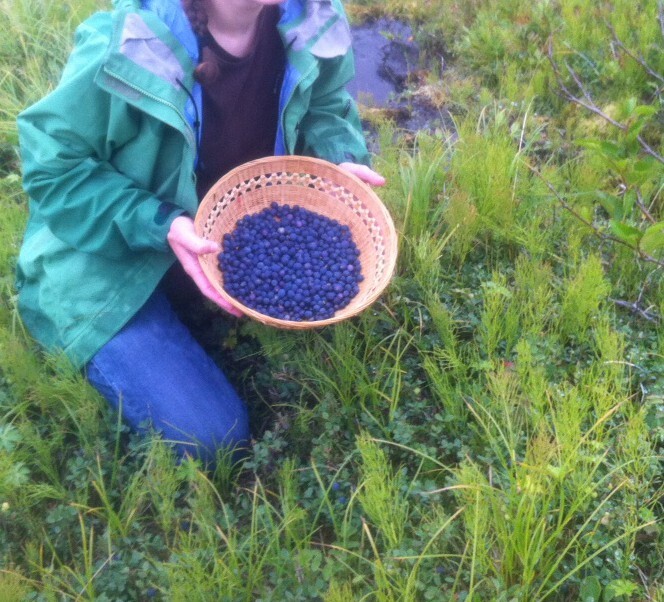 Honey berries are a pretty blue oval blob with a sweet and accessible taste. Unfortunately, I’ve had bad leaf rollers the last two years and they have ruined most of the berries before they can ripen, but as my plants get larger and pest populations ebb I expect great things! I do have a couple of blueberry plants (Ericaceae family) too, another non-rose family, but they limp along in my yard, and it is great to get up in the mountains and pick the much tastier wild blueberries by the gallon in the fall. 6. Elderberry (Adoxaceae family – same family as highbush cranberries!) 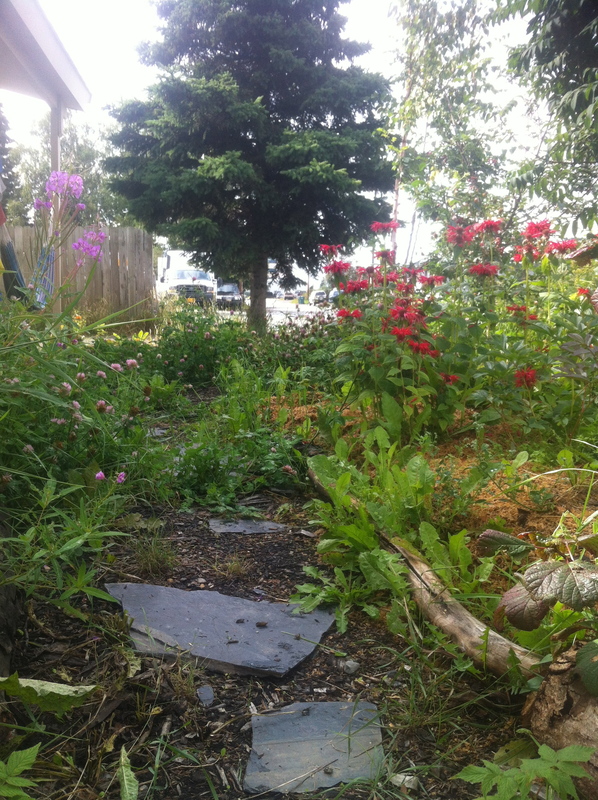 – red are native, and a better bet than blue or black to grow in your yard in Anchorage. The flowers make good fritters, or juice/soda/wine, the berries are the only thing I’ve ever made wine out of – tasted like Boones Farm, but nicely alcoholic! I’m trying a couple of domestic blue plants, but I’ve failed before with these, so may be difficult to grow this far north. 7. Mulberry (Moraceae family) – probably require more Growing Degree Days than we have, but global warming/microclimates might help! I planted one from St Lawrence Nurseries this year, we’ll see if it makes it through the winter and does anything fruitful in the future! A male Sea Buckthorn in search of a female! 8. Elaeagnaceae family – Goumi, russian olive, Sea buckthorn, etc – Sea Buckthorn definitely fruits here, and tastes a bit like tang, or Hawaiian passion fruit orange juice. Yum! 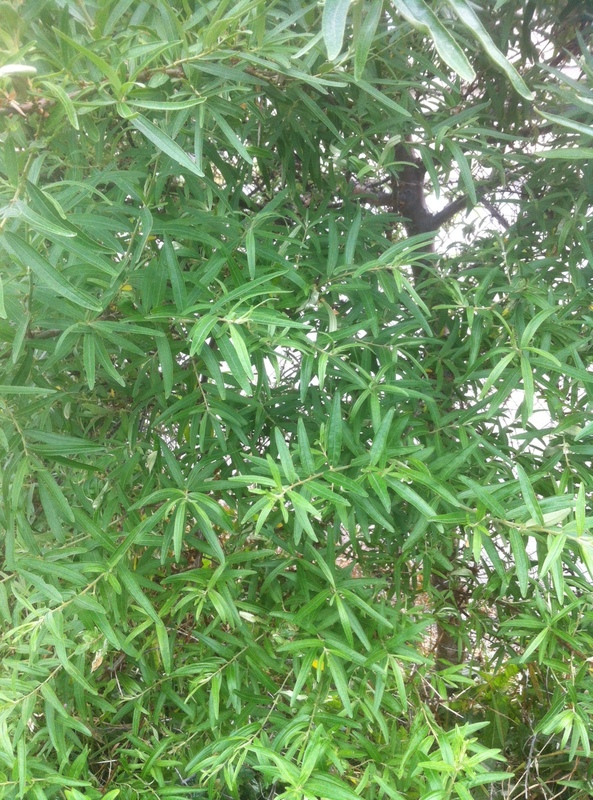 Russian olive is widely sold here as an ornamental, but mine died. Other members of this family might work! 9. Wolf or Goji berry ( Lycium family) antioxidant rich, faddish ‘super’ food – for what that’s worth. Hardy to zone 5, some maybe to 3 – but do we have a long enough season? Maybe worth a try! 10. Pawpaw (Annonaceae family) Temperate member of an otherwise tropical family. A large, native fruit depended upon by early inhabitants of the eastern US. Nutritious. I’ve never tried it. Low water content like a banana. Needs water and probably way more Frost Free Days and Growing Degree Days than we have in Anchorage…but I can dream because, according to the internet, Pawpaws have a creamy, custard-like flesh with a complex combination of tropical fruit flavors. But it is on my list to put in a tree and see…someday, because this is a stretch! I also dream of persimmon and various nuts (chestnuts, heart nuts, hardy hickory) that would be serious experiments. I have some hardy hazelnuts that grow well, and even have male and female flowers, but so far have failed to set any nuts. One of my problems is that I have an urban yard and can only experiment with a couple of trees in most cases. For plants on the very edge of being in acceptable growing conditions, one would need to plant a huge number of genetically distinct plants to roll the dice on finding a collection of genes that might be adapted to our conditions. What crazy fruits or other perennials have worked for you in the far north?? Let’s learn from each other! I’ve been wanting to make an earth bag dome forever (and click that link if you want to know what the heck that is or how to do one right!) I’ve been saving poly woven bags since my days collecting soil samples in them for work. I finally had a project to use them for: there are too many poultry on site to shove them all back into my chicken house for the winter so I needed to make a duck house. 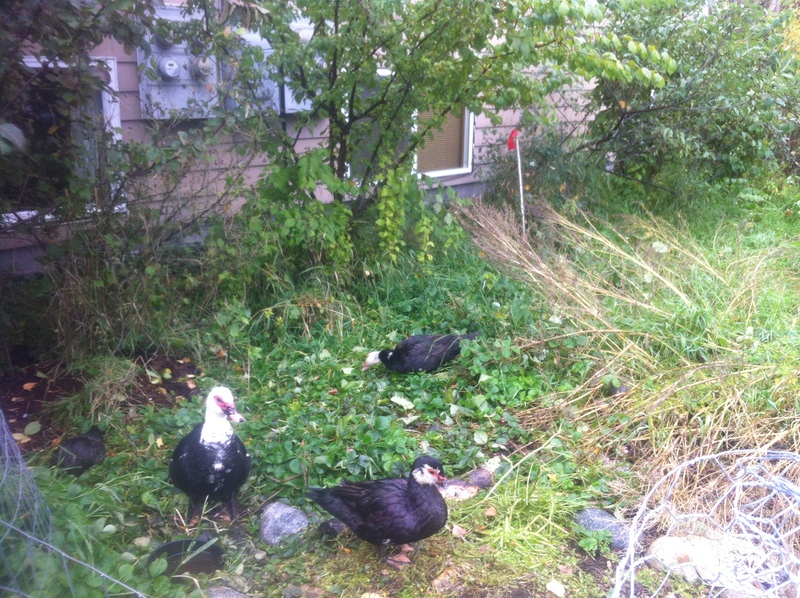 I have 5 Muscovies now, and even though they need less protection than chickens in general, it’s extreme enough in Anchorage that they needed a warm place to sleep in the winter. I started by shoveling off the turf and topsoil (less than 6 inches) in a circle. I scribed the circle with a stick on a string attached to a centrally placed pole. 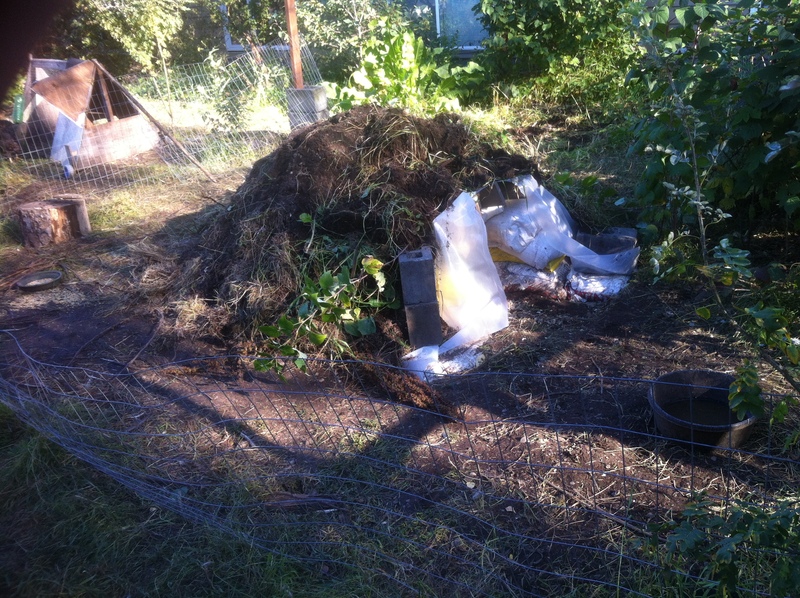 Then I filled bags with the gravelliest soil I could find on my lot. The inside diameter of this first ring is a little less than 4 feet. I was running low on gravelly soil, so I went to the home improvement store and bought about $40 of pea gravel (10 bags) to do the next level. 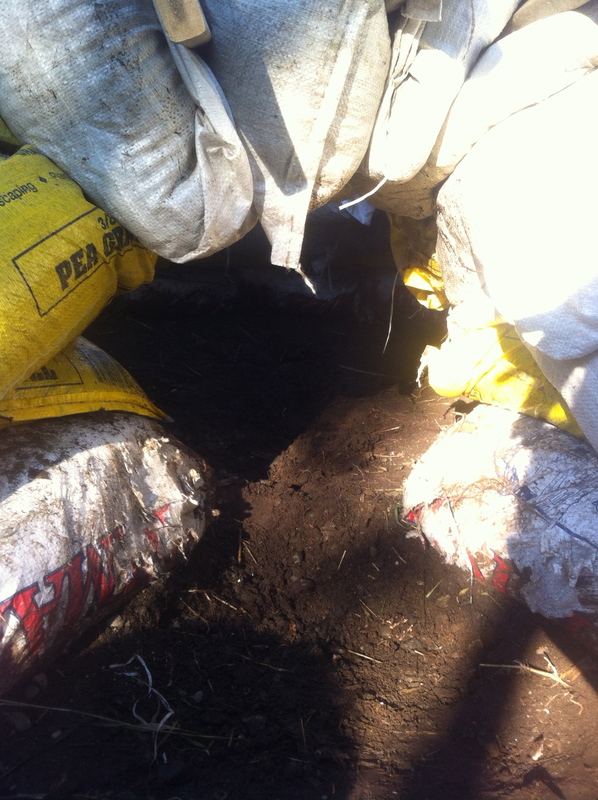 This creates a barrier to moisture wicking up into the rest of the structure. 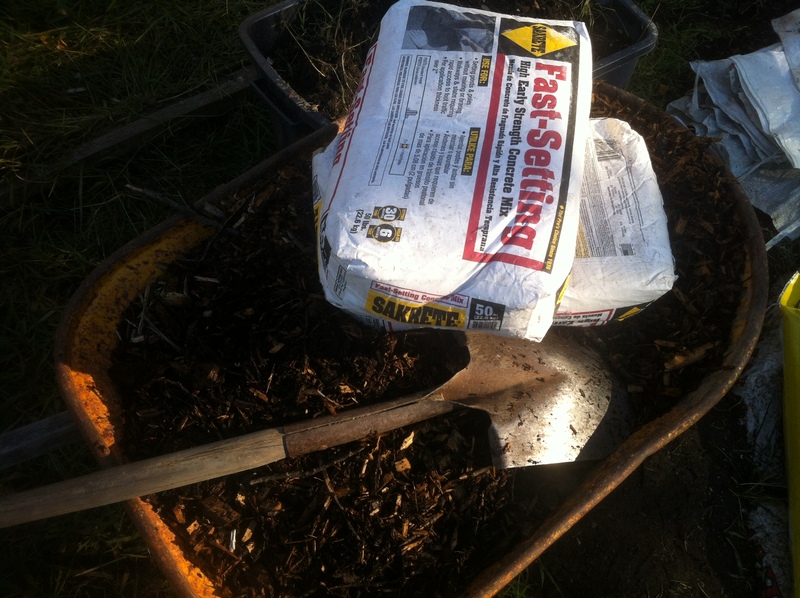 Then I had the brilliant idea of using wood chips in the rest of the bags instead of soil. Mostly because they are lighter and easier to move and I have a ton of them. 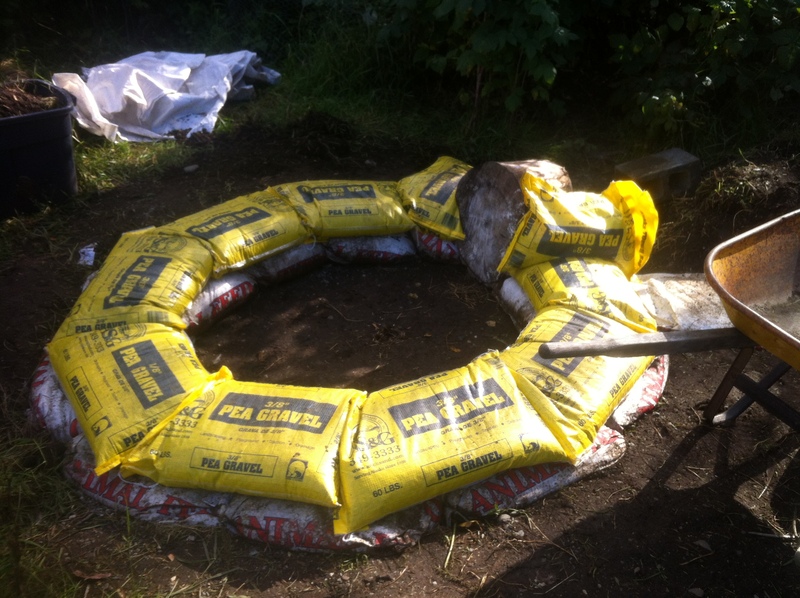 They would be more insulating that soil…think straw bale, kind of. 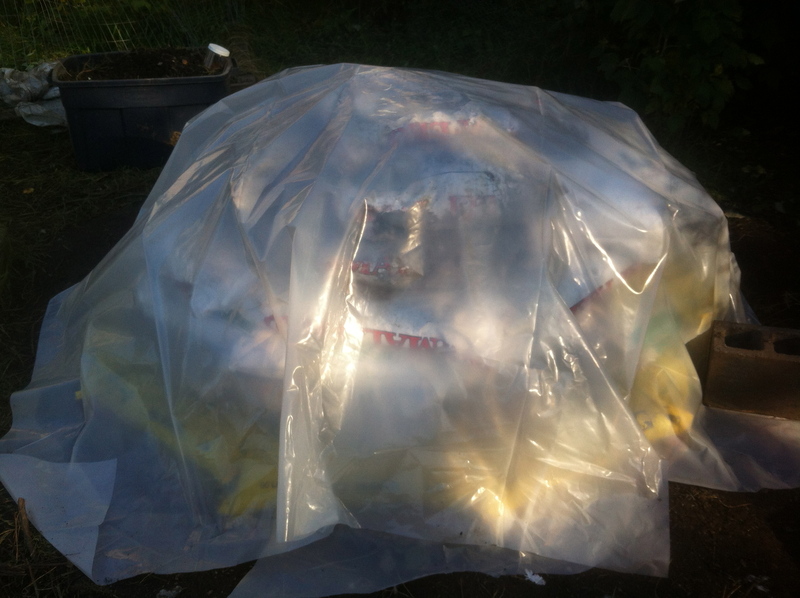 They would not have the strength of soil bags though, and have a high danger of decomposition and the resulting instability. 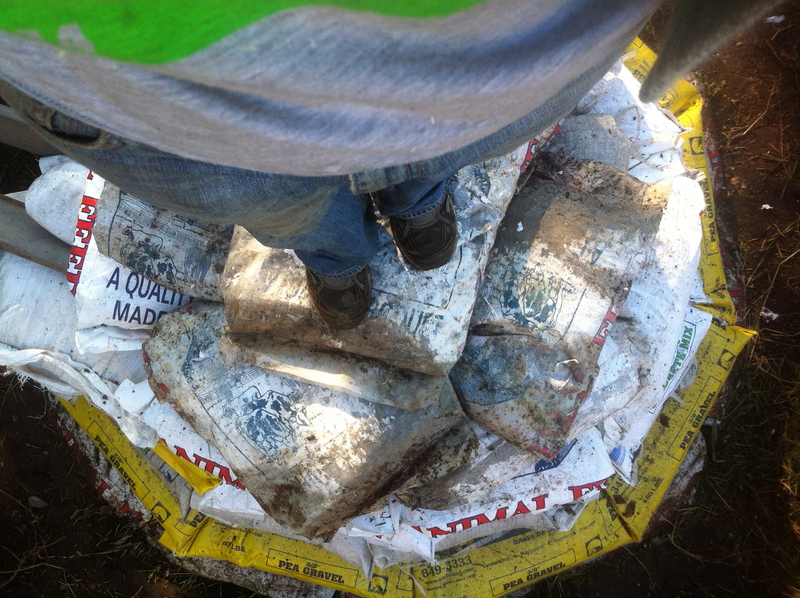 I also had 7 bags of ready mix concrete that were getting a little solid from sitting around for a while. Maybe woodchipcrete would be a little more stable? 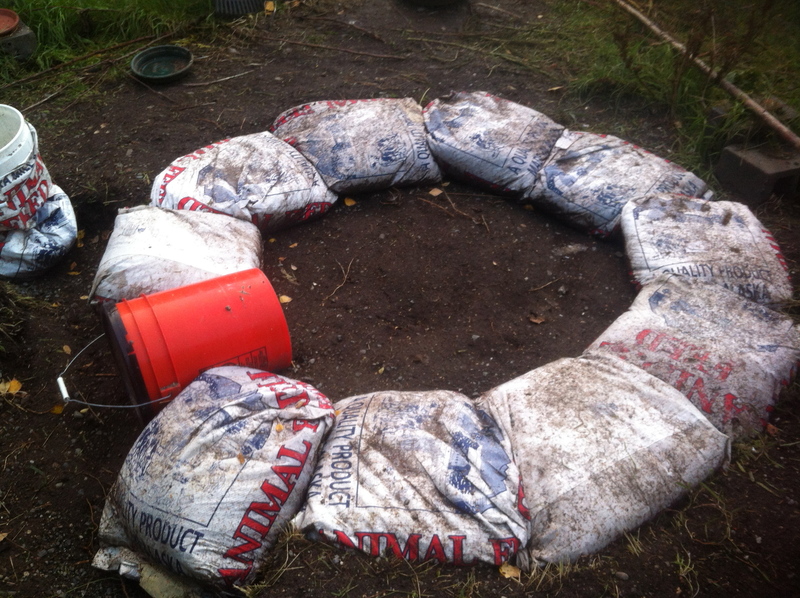 SO I mixed in one 50 lb sack per wheel barrow load: This worked for most of the layers in the dome, until I ran out of concrete mix for the last couple of layers, but everything seems pretty stable…for now. Here is a selfie of me standing on the top: And here is a door detail: I used a big cottonwood log as a form for the door, but it wasn’t as wide as the bags so things did settle to a little smaller than I would have liked, but still big enough for a duck. 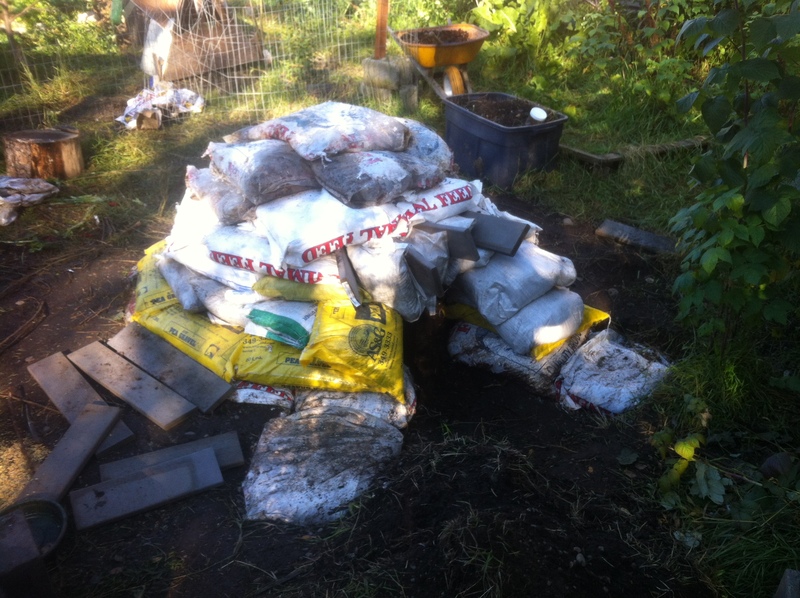 Then I covered everything with 6-mil poly (builders plastic/visqueen) to hopefully keep the rotting to a minimum: And threw the top soil and turf back on: And lo and behold, after baiting it with some canned salmon, the ducks finally trusted it enough to go in at night! So we’ll see (and I’ll let you know) how things go. There is no ventilation other than the doorway. I will have to pull the poopy bedding out with a potato fork since even a rake is too big to get through the door. If they lay eggs in there that I don’t want them to hatch, it’ll be fun trying to get them out. My moisture management could fail miserably and things could settle or collapse in catastrophic ways (which could lead to a big pot of duck stew in a worst case scenario). I will have to shovel snow out of the entry. Next year I’ll have to get some sort of stucco over the non-dirt covered part of the entry so that it doesn’t photodegrade. It really didn’t take much time, energy, money, or materials to build, so I figure the risk is low for this experiment! I have evolved into primarily a forest gardener. As a child, I had some fairly unsuccessful gardens in the shady margins of the yard, and relied on carrots from my mom’s raised beds to sustain me. Mostly, I was oblivious to the effort to turn out an edible yield. When I first started to garden seriously in grad school , I quickly realized that gardening threatened to turn me into an enemy of wilderness. My young self had once waxed poetic about delicate, trumpeted bindweed flowers and mischievous raccoons, and my Kansan farmer grandma had responded with a ‘bahh, I’d poison ’em all!’. I was indignant. That was until I started cutting slugs in half with shears, and realized the nature of her antipathy. I have worked hard to try to not let my unconditional love of wilderness, all of her, be slowly turned by a sense of battle against her for my own needs. In that vein, I chose no-chemical, no mow, low energy methods without even a thought. Through extensive reading and experimentation, I have evolved my own Alaskan forest garden style. In general, forest gardening involves the extensive use of edible perennials and easy reseeding annuals arranged much as nature would, with layers – plants that have extensive roots, low ground covers, herbaceous plants, bushes, vines and trees (and possibly multiple stories of trees). No gardening method is really low work. More ecological methods tend to involve a lot of work and/or money up front (digging big holes, sheet mulching, gathering materials, buying trees, etc) and the hope is that it evolves into a low input, self-sustaining system. You won’t be tilling every year, buying as many new plants, adding lots of fertilizer, etc. In practice, I am usually still filling in where trees didn’t make it, pulling quack grass, mulching, spreading compost, re-wood chipping paths, and other things every year. But the way the work is distributed really fits my nature – my motivation runs in cycles. I can happily spend all day in the yard pulling invasives and mulching one day, only to spend the next week unable to leave the house. This doesn’t usually phase a forest garden. 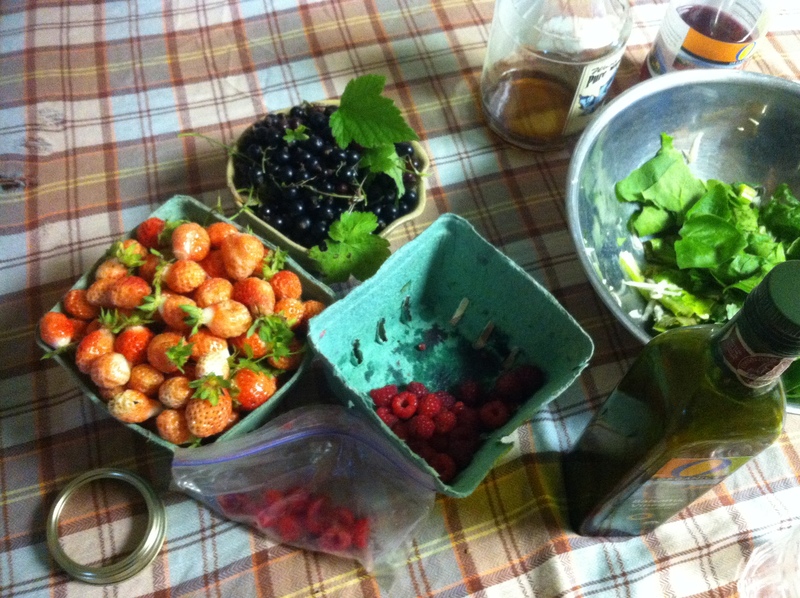 Berries and fruits – unsurprisingly, since I have concentrated on planting and nurturing trees and bushes I have gallons upon gallons of apples, currants, raspberries, strawberries, juneberries with lesser amounts of aronia, improved mountain ash, and arctic kiwi. Hopefully soon my cherries, sea buckthorn, apricots, pear, and cherry-plum will bear – again or for the first time (most of these need me to plant a good pollinator). I make pie, juice, soda, and preserves. We eat a ton straight from the bushes, and freeze the rest for later. My roommate makes great fruit leather and ciders/wines. Herbal Teas – My son loves to pick the self-reseeding annual german chamomile and add vanilla and honey to make tea. My favorite is roasted ground dandelion root – just as good as coffee to me! I really love the rich aromatic satisfaction of starting my day (or ending it) with a steamy cup. I also am drying rose hips, currant and raspberry leaves, sea buckthorn leaves, mint and others for tasty, healthful herbal tea for the winter. I am trying out dandelion leaf and horsetail (my do I have a lot) as a diuretic tea to help with PMS bloating and the sinus headaches that causes me every month, we’ll see if it helps. Weeds, uh I mean Greens – I make huge batches of pesto with weeds. Sure, basil or arugula (which does self seed in my yard, but I need to give it a bigger space, it got crowded out this year) is the best, but lacking that my abundant dock, dandelion leaves, lambs quarters and chickweed make great pesto! It’s bright green and mostly its the oil and garlic you taste anyway. My recipe is simple – blend a few garlic cloves and walnuts (or other nut on hand – I use the nut closest to the nexus of cheapest and most sustainable I can find), add a bunch of olive oil, a quick pour of salt, and as many leaves as I can cram in the blender. I also put all these things in salads. I’m not a big fan of bitter greens, but a few is ok and lambs quarters are great for having a mild spinachy flavor. They also get sautéed or stir fried and added to eggs or any recipe that can take a green. Or blanched and frozen…basically they are all nutritious greens that I couldn’t keep from flourishing in my garden if I wanted to. Not having other choices really helps me utilize them. 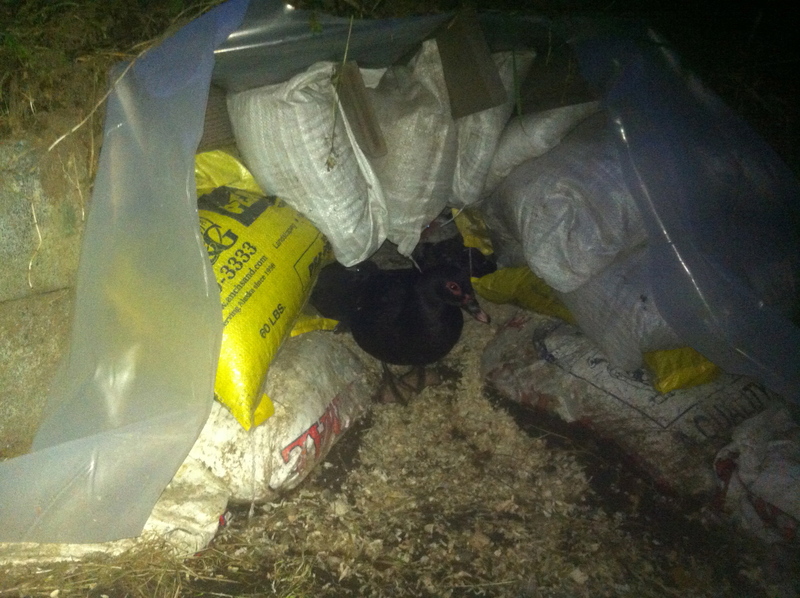 Eggs and Poultry – My chickens and ducks eat barley that I buy for them and salmon guts and waste and table scraps. Other than that they are on the yard all summer, eating grass and weeds. The ducks are in a big pen, the chickens in a movable tractor right now. 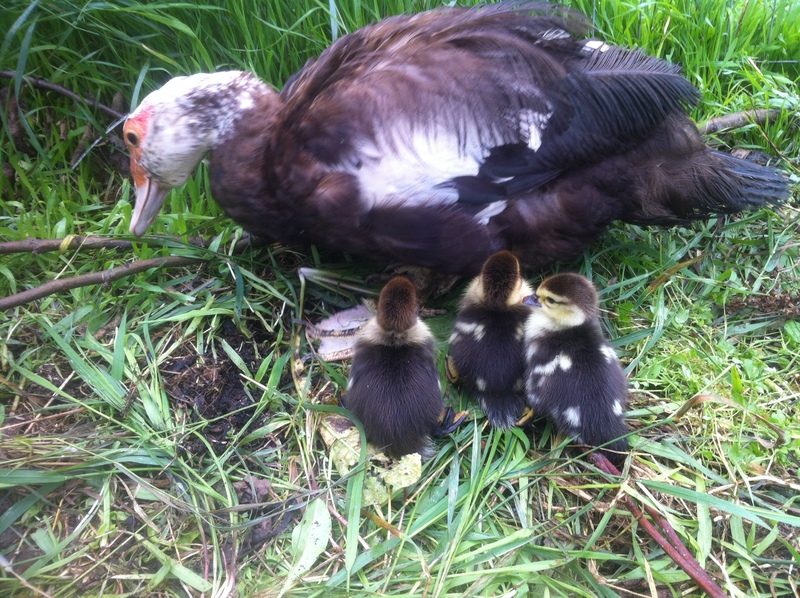 I get regular eggs and baby ducks (male muscovy ducks don’t make loud noise and can be kept in town, unlike roosters). This year there are three baby ducks, and a couple of those will probably become dinner, depending on gender. Two of my three laying hens are bad at laying in their old age too, and will probably be saved the long cold winter by becoming stew hens. They will be replaced with chicks in the spring. As you can see, I am not aiming for some pipe dream of self-sufficiency. The bulk of my calories is still from grain products bought at the store. I also eat a lot of meat and occasional dairy – from fishing, the store, local farmers, what have you. I would love to cut down on this and am getting there… I have a small plot of land in the city. I could grow a lot of potatoes, and usually do have at least some, but I don’t find it too hard to justify eating whole grains and other products from other places. It saves a large amount of expense and the woes of our current food production system for me to produce most of my own fruit, eggs, greens, and beverages. Black currants (ribes nigrum) are my favorite fruit right now! 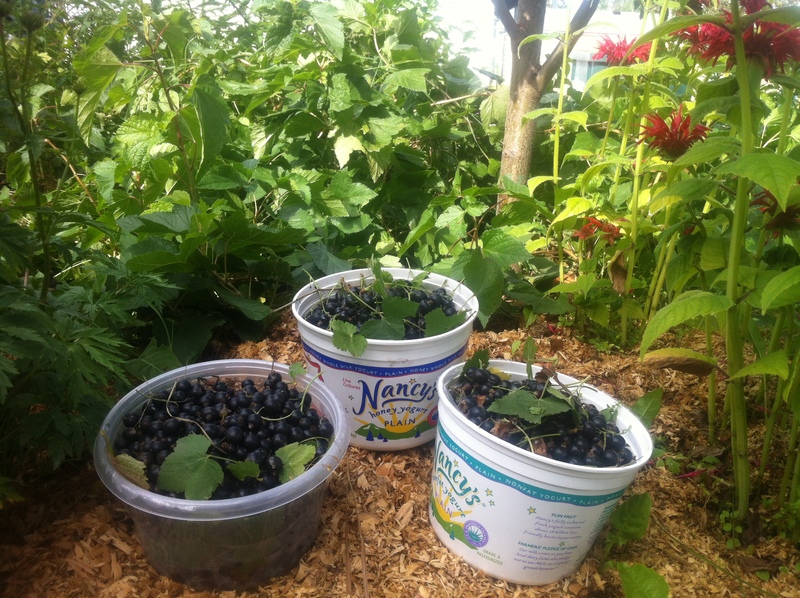 I am growing 3 big bushes – Titania, Consort, and an unnamed variety from the local farmers market. The unnamed bush gave me 1.5 gallons/ 8 pounds of fruit yesterday. The Titania was a little overripe already, but I got 3/4 of a gallon that hadn’t fallen and rotted yet. The Consort is less ripe and I’ve only picked about half a gallon off of it, but there are more to pick. It is also in the shade and currently (hah! get it!) has some mildew problems. I like black currants because they are vigorous and hardy and produce a lot. They grow well about anywhere I plunk them down in my yard in Anchorage – right under an apple tree’s shade, out in the sun, wherever. They are a great permaculture guild plant; I have a corner with an apple tree, black currant right next to it, white currant next to that, and arctic kiwi twining through the whole thing. Red clover surround this dense mix, and everything produces well and catches just about all the light before it gets to the ground! Unlike my red and white currants and gooseberry, they don’t get touched by the totally defoliating currant worm. They get a few leaf rollers (or tent moths or whatever you call them) in a bad year like this, but nowhere near as much damage as apple and other fruit trees. They are very easy to propagate. The branches that touch the ground root and can be clipped off, pulled up and replanted elsewhere. If no branches have done that yet, you can always pin one down to root, but most of mine have a very sprawling habit and are rooted all over the place. They are pretty easy to pick, the fruit is on stringers that can be plucked or cut off as a cluster. They are less of a pain to pick than strawberries and raspberries, where the fruit are a bit more separated and ripen over a longer period (I lose a lot of straws and rasps by not going out every day in the season to pick). They are harder to pick than my apples since my apples are bigger, at standing height, and less hidden under leaves, but for small, easy fruit they win! Generally, I can pick some into my mouth for a couple of weeks, then choose a good day, like yesterday, and go out and harvest almost all of the crop and process them in one day. And be done with black currants! I tend to like to eat them fresh – they have very very high vitamin c content and are quite tasty. You may need to develop a taste for them, they are a little skunky, but that grows on you more and more! I’m sure it is this spicy skunkiness, that is also in the leaves, which keeps the chewing insects at bay. I love brushing by the leaves in the spring and getting a whiff of that wonderful perfume! I also can juice concentrate for italian sodas with them. This is more likely to be consumed by my son than jam, and I think most people would find it tasty…mellowed by sugar. I’m going to try to make a little fermented soda this year by throwing some yeast in a bottle of juice concentrate and water and see what happens…hopefully not a broken bottle! My roommate makes a good black currant fruit leather. They can also be frozen for later use if you can’t decide what to do with them, or want to throw them in baked goods or something in the winter.